SEPTEMBER 18, 2017: EPA Office of Water to hold webinar from 1:00-2:00pm EST to review and clarify its recently published draft aluminum aquatic life water quality criteria document (Docket ID: EPA-HQ-OW-2017-0260). EPA first released freshwater criteria for aluminum in 1988 to protect aquatic life from harmful effects of aluminum toxicity, which can inhibit an aquatic organism’s ability to regulate salt concentrations and clog fish gills, potentially resulting in death or affecting growth and reproduction. EPA is updating the aluminum criteria to better reflect the latest science and, in response to a consent decree for Oregon, propose aluminum standards. Studies have shown that three water chemistry parameters -- pH, dissolved organic carbon (DOC), and hardness -- can affect the toxicity of aluminum by impacting aquatic species’ overall exposure to aluminum. Unlike the fixed values recommended by EPA in the 1988 document, this draft document provides users the flexibility to develop site-specific criteria based on a site’s water chemistry. To support the development of site-specific criteria, EPA is providing lookup tables as well as an Aluminum Criteria Calculator. To register for the webinar click HERE. SEPTEMBER 19th, 2017: Webinar, Naturalizing Early Childhood Education in Colorado: The ECHO Initiative, 3:00pm to 4:00pm MST. Join CAEE for an informative webinar with Sarah Konradi, from the National Wildlife Federation and Adrienne Sedlack, from Qualistar, to learn about the ECHO Initiative and the Outdoor Learning Environment Toolkit, participate in an interactive conversation about current early childhood environmental education programs, and share with them how your work fits with ECHO Initiative goals as we seek to elevate the quality of outdoor learning environments across the state. Healthy, natural, affordable. These are the foundations of Colorado's new Early Childhood Health Outdoors (ECHO) Initiative created to ensure all young children in Colorado have daily access to quality outdoor learning environments where play and learning support development across all domains-cognitive, physical, social, and emotional. Register HERE. SEPTEMBER 22nd - 23rd, 2017: Citizen Science Workshop in Aspen: The Leaf Pack Science Experiment. Every autumn, the colorful leaves fall off the trees and blanket our forest floors and riparian areas. It's a little known fact that many of those leaves also blow into streams and are an instrumental food source for the aquatic insects that fish eat. Just how do we use leaves to study stream health? Join the Roaring Fork Conservacy, in partnership with Stroud Water Research Center and ACES, to learn how YOU can help collect valuable data about our local streams. Details of this workshop and registration can be found HERE. with Friends of the Forest Foundation from 2:00 pm - 3:30 pm EDT. You’re invited to join an upcoming peer learning session! Managing Volunteer Recruitment and Retention will introduce common issues surrounding volunteer recruitment and volunteer retention, provide helpful tips, and identify current issues faced by volunteer managers. REGISTER HERE. SEPTEMBER 26th, 2017: At 1:00 pm, join in on the Alliance 4 Water Efficiency (AWE) Webinar - Managing Peak Demand Through the Use of Smart Technology. Is your utility suffering from high peak demands from landscape irrigation? Are you wondering how technology might be able to help you solve this problem? Then this webinar is for you! This study explores the viability of using remotely-controlled irrigation systems to reduce peak water demand. Register for this webinar NOW. For the Peak Day Water Demand Management Study, click HERE. SEPTEMBER 28, 2017: Webinar, Drowning in Data: Monitoring Harmful Algal Blooms starting at 12:00 pm Mountain time. You're invited to join Dr. Stephanie A. Smith of YSI, a Xylem Brand, and Chuck Springer of Aquatic Informatics as they review best practices for managing and interpreting algae data. They will demonstrate how spreadsheet tools can be used to process data and will also discuss common challenges with data management in spreadsheets. The webinar will also include information about the limitations of sensor technologies for describing algal biology in units such as CFU/ml and a discussion on how software can be leveraged to estimate some of these values. Register online here. 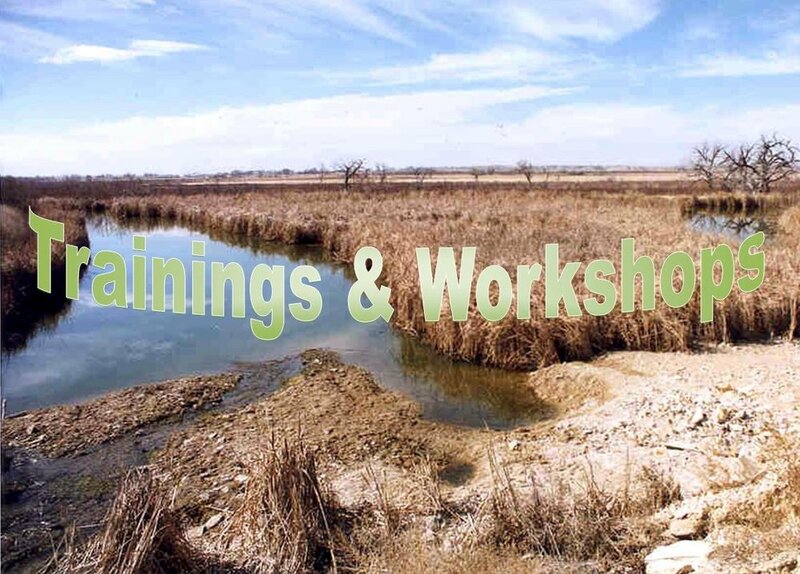 SEPTEMBER 28th & 29th, 2017: The National Stormwater Center is offering Certified Stormwater Inspector (municipal) training. Designed specifically for municipal personnel, their course offers training and certification to demonstrate, for the record, that inspectors are qualified. Inspectors who take their course learn how to inspect construction, commercial, and industrial, and municipal activities, what to inspect, the limits of their authority, appropriate demeanor, and appropriate discretion. They also learn about the Clean Water Act, the National Pollutant Discharge Elimination System, the six Minimum Control Measures, and how to better implement and support their MS4 stormwater program. You may call Michele at 1-888-397-9414, email info@npdes.com or visit their website at www.npdes.com. Registration is available on their website for all classes. SEPTEMBER 28th, 2017: UAS's ("Drones") and Urban Forestry: An Introduction to their Application from 12:00 pm - 1:00 pm EDT. Unmanned aerial systems (UAS's) or "Drones" are becoming more prominent in a variety of fields, including the urban forestry sector. Join Professor Charlie Schweik, a member of the UMass Department of Environmental Conservation, the School of Public Policy and a new group called "UMass Air", as he discusses key UAS concepts, components of UAS missions, and data analysis strategies behind UAS applications. To attend, visit www.joinwebinar.com and enter the ID code 970-082-427. This broadcast is free and will offer the opportunity for arborists to earn 1.0 ISA CEU and 0.5 MCA credit. For those who are unavailable to attend the live broadcast, sessions will be archived in the "videos" section at www.urbanforestrytoday.org. OCTOBER 4th, 2017: Careers In Natural Resources Workshop: Grand Junction from 11:00 am - 4:00 pm. Help young adults on their path to a natural resource career! Join Colorado Alliance for Environmental Education to develop a training model for using the Career Guide in your programs. Attending organizations will receive kits with hard copies of the Career Guide and digital resources including activities, handouts, and presentations. Get to know the "How-To Guide for Pursuing a Career in Natural Resources" - an in-depth career development tool for young adults - and how you can use it. Get an insiders perspective on getting hired from a panel of state and federal natural resource professionals. For more information and to register go to, caee.org. OCTOBER 26th, 2017: Webinar, This Is What STEM Looks Like! A conversation about inspiring, motivating, and retaining girls and young women in STEM from 3:00 pm - 4:00 pm (MST). Presenters will be Violeta Garcia, Stem Learning by Design and Louise V. Myrland, The Women's Foundation of Colorado. REGISTER HERE. November 6th, 2017: Colorado Foundation for Water Conservation is hosting a workshop in Colorado Springs, CO, 2017 Considerations in Implementing Regional Water Solutions. As Colorado’s urban areas grow, we must consider leveraging resources, infrastructure, water supply and facilities to secure general well-being and a healthy economy. This informative, day-long workshop provides a forum for planning and discussion around the best approaches for regional water solutions. It includes a close examination of the tradeoffs, hurdles, and opportunities for success. For more information and to register, click HERE.